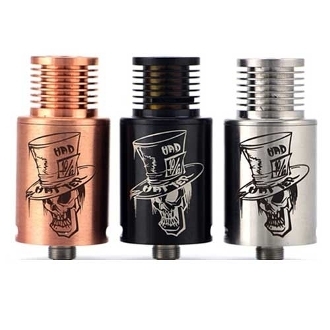 The Mad Hatter RDA has a unique dripping design where its top cap flips open to make dripping much easier and less messy. Inside the deck has a triple-post design with two huge airflow holes which bring in cool air right underneath the coils. This will give you intense clouds. The ultra-deep juice well holds plenty of liquid, giving you great flavor and vapor production with every vape. The Mad Hatter clone measures 22mm in diameter to fit most mods on the market and comes with a copper center pin.